When I first got into the direct sales business, I worked for a man who had a colloquialism for every occasion. One of his favorites was : "Now and then even a blind squirrel finds the odd nut." Not Pulitzer Prize material, true. But in this case, appropriate. I happened to be beside a charming couple at a trade show who were selling a hummingbird feeder. We chatted - as you do at these shows - and the fact that these two very intelligent folks were so adamant about the quality and design of this product made me pay attention. (Sadly - I had a lot of time on my hands at this show). Best of all - they are made here in the USA - not overseas. Long story short, we now include in our product line this very same feeder. And I am here to tell you the it is, in my opinion, THE BEST HUMMINGBIRD FEEDER EVER. Full stop. It delivers top quality construction and design, ease of filling, cleaning, and maintenance, with NO pesky insect interference. I LOVE it. Read the features below. Watch the videos. Read the testimonials. Order one - or two. You, too, will become a fan. 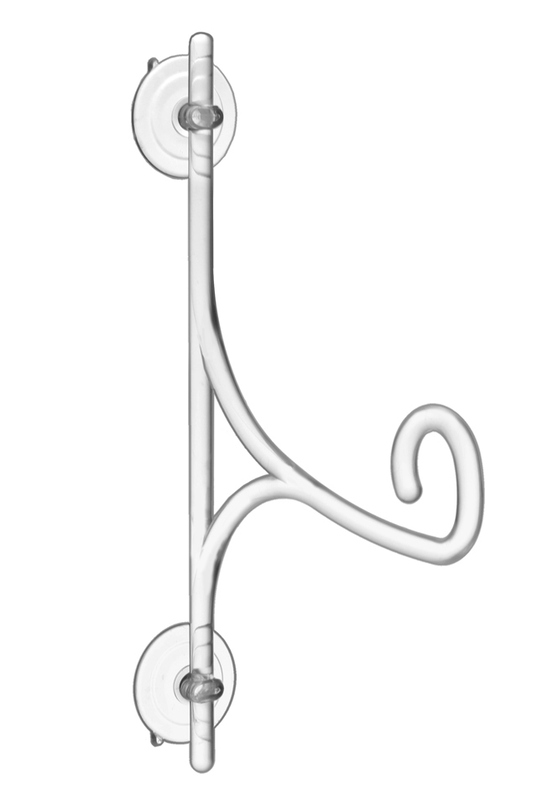 We have even got the ideal Window Glass Hangers for it. Extremely tough highest quality UV resistant polycarbonate material (made in the U.S.A) Heavy duty construction to last. NEW We now offer purple, Cobalt blue, and fuchsia feeders. Same price, same specs. Same everything. Different colour, OOOOOps .....color. NEW - Get a BIGGER feeder! 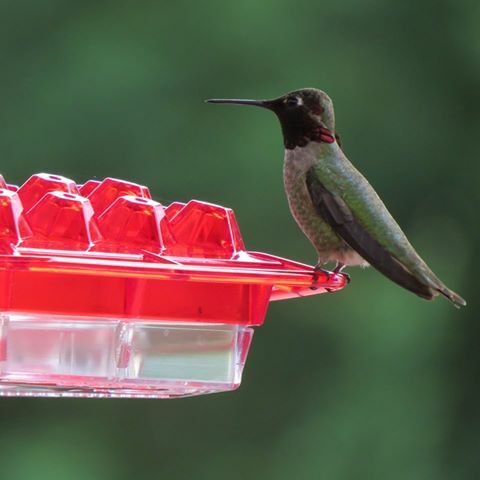 Holds 20 ounces of nectar – larger capacity feeds more hummingbirds while you fill less often. Raised feeding ports prevent Rain from running into bowl. NEW Hang it in Style with a Window Glass Hanger! 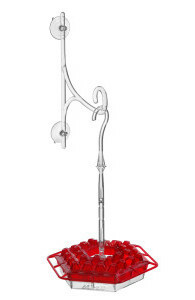 Our beautiful window glass hanger is also made in U.S.A. and holds up to 4 lbs. "I purchased the hummingbird feeder at the Philadelphia Flower show and waited till June to hang it. There are hummingbirds every day. One shows up about every 30 min and gets its last drink right before darkness. I simply clean it in the dishwaser every 2 -3 days. Great product. will buy more next spring." "I just bought your feeder at our local fair. I must say its worth every penny. Im in love snd will tell everyone how amazing your feeder is. Thank you from Southern Oregon. My hummers are happy...the bees not so much lolol ??" 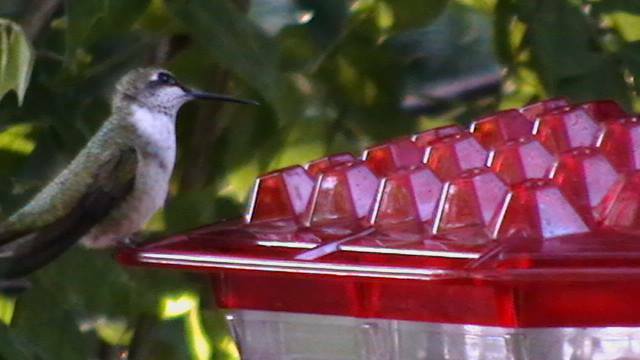 "I just bought one of your hummingbird feeders last night at the state fair in Springfield, IL. I hung it this morning next to another feeder that was clean and empty. Sitting here just NOW, I saw a hummer feed at the new feeder. It didn't take long at all. Also, I microwave my sugar and water and then cool. I keep it in the fridge and fill feeders as needed! I did not prepare the sugar water as directed on the information sheet. I am so glad I spent the money on it. It is so much better than what I was using. Thank you.I thought $30 was pricey but I liked the concept. I have been using the Perky Pet 3 ounce feeders because I the sugar water lasted so long. 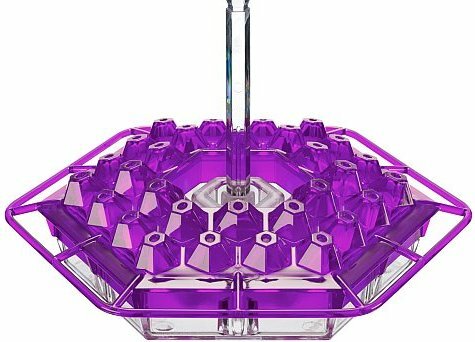 But the bee guards on them are hard to replace because Perky Pet has such high shipping price and I'd have to get hundreds of them to make it worth it. With this feeder I will be tossing the 3 ounce ones in the trash. AND this one will be so easy to clean. AND I am not using the bug preventer with it. It is just hanging on the hook out on the patio. I have probably spent more than $30 in two years on 3 oz new feeders and bug things. Now I will just wash my new one year after year and it won't cost me any more!! By the way, we had a heck of a storm at the fair last night with 3 plus inches of rain in an hour. Flooding everywhere but we were lucky to get out of the parking long and on our hour trip for home!!"